Looking for an easy appetizer recipe for a mid-afternoon soiree, or want to include a complementary appetizer at your wine and cheese party? Look no further than the Parmesan Crostini! Preheat oven to 250°F and set out two large baking sheets. 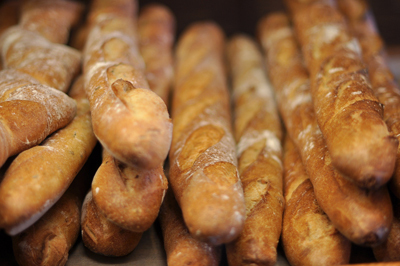 Arrange baguette slices onto the baking sheets. In a small bowl, combine the melted butter and garlic. Drizzle half of the mixture over the bread slices. Bake in preheated oven for about 10 minutes. Turn the slices over and drizzle remaining mixture over the slices. Return to the oven and continue baking for 50 minutes – 1 hour (or until golden brown), flipping the slices over every 10 minutes. Remove from oven and immediately sprinkle the top of each slice with grated Parmesan cheese. Serves about 14 people. If you would like to know more about wine and cheese pairings, take a look at this guide by WineEnthusiast, and learn more about the different types of cheeses here. This entry was posted on Tuesday, July 25th, 2017 at 3:28 pm	and is filed under Appetizers & Dips, Breads, Recipes, Snacks, Tasteful Tuesday. You can follow any responses to this entry through the RSS 2.0 feed. You can leave a response, or trackback from your own site.